The civil conflict in Syria is entering its fifth year and continues to escalate. It has left 7.6 million people displaced within the country, according to United Nations estimates. Over 4.4 million have sought refuge in neighboring countries and northern Africa. This number is expected to rise. Nearly 633,500 Syrians are registered as refugees in Jordan. More than three quarters are living in Jordanian host communities. In some areas, refugees outnumber Jordanians, creating tension over dwindling public and natural resources. A quarter of all refugees live in the three camps of Za’atari (79,253 refugees), Azraq (28,670 refugees) and Emirati Jordanian. Two out of three refugee households live below the Jordanian poverty line. The UN World Food Program says the number of Syrian households resorting to emergency coping strategies in 2015 doubled in just one year. The most vulnerable tend to be female-headed households and children, as well as households that include people with disabilities. Unable to earn money or with reduced mobility, women, children and the disabled are at particular risk of sexual harassment and exploitation. The war has created severe implications for future generations of Syrians. LWF has been working in Jordan since 2012, assisting refugees from Syria and Iraq accommodated in host communities and in camps. Until last year, LWF has provided assistance to more than 200,000 refugees and vulnerable people in Jordan. In 2015 alone LWF provided assistance for 67,081 people in Jordan. With a rise in domestic violence, children and young people need somewhere to get away from conditions at home from time to time. Since the Za’atari camp was opened in 2012, LWF has distributed hygiene kits and heaters but the main work lies in conflict mitigation, peacebuilding, life-skills training and recreational activities. LWF opened its own youth centre, the Peace Oasis, in 2013, a safe area for young people aged 14 to 30. The Peace Oasis teaches young people how to reduce tension and negative coping strategies. Through discussions and training – led by other refugees - in conflict and communication skills, decision-making, mediation and negotiation, as well as emotion management, participants learn to find solutions to problems. They also learn skills which will benefit them in the future. During 2015 LWF provided 3726 vulnerable households with food. In addition, it helped 4945 households through water, sanitation and hygiene facilities, and hygiene distribution, provided 2720 school girls in Mafraq and Irbid with new school uniforms, and provided 2420 school children in host communities and 200 school children in Zaatari camp with school bags. Winter is a critical period for vulnerable Syrian refugees in Jordan who already face harsh living conditions. Temperatures can drop below zero degrees, which puts pressure on households. LWF distributed gas heaters, gas bottles, gas refill coupons and blankets in January 2015 and in December 2015 to 1885 households. LWF initiated a cash assistance project in November 2015 that will run until mid-2016 for 226 vulnerable households in Irbid governorate. Cash assistance projects have become increasingly. Three percent of boys were sent to work in 2014 but a year later, the number had risen to 15 percent. LWFs cash assistance project aims to assist vulnerable households and to prevent child labor and early marriage. Of the 1.5 million Syrian refugees living in Jordan, more than half are children, many school-going age. They have been taken in by the Jordanian school system. In many schools , children are taught in two shifts in the morning and afternoon. Rehabilitating schools in poor conditions and providing extra classrooms is therefore critical for refugees and host communities alike. On 20 December 2015, LWF handed seven refurbished schools in the north to the Ministry of Education, a moev that will improve the learning environment for 2450 children. These school were previously in poor condition, with leaking roofs, mold and too few toilets. During 2015 LWF constructed 18 new classroms in three schools benefiting 450 students and rehabilitated seven other schools. In January 2016, LWF started rehabilitating schools in Irbid and Amman Governorate. In addition, LWF will improve five schools in southern Jordan. LWF provides life-skills training to Syrian refugees and vulnerable Jordanian households as an extra part of psychosocial support. Having learning opportunities does not only counteract the feeling of wasting time but also helps refugees develop skills for their future. Among others LWF offers courses in computer skills, graphic design, English, barbering, hairdressing, make-up/beautician art, sewing, and mobile repairing to refugees in and outside the camps, as well as host communities. 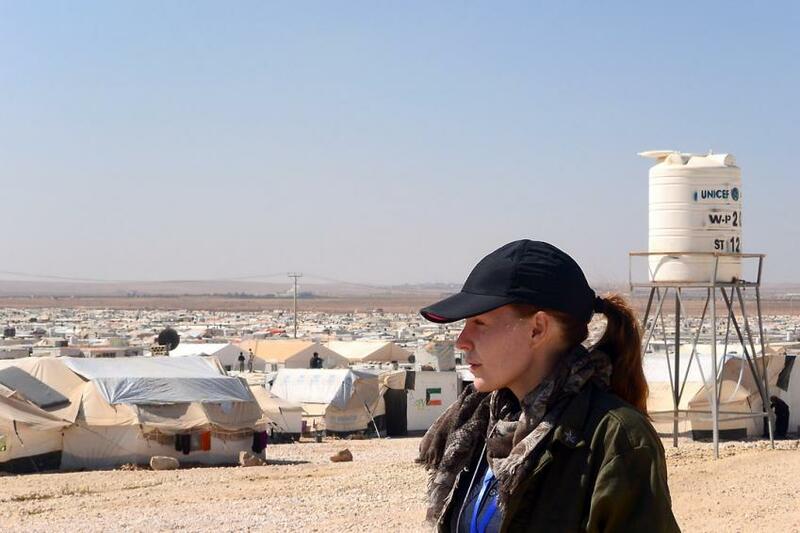 Department for World Service committee member, musician and medical student, Jenny Moe, dedicated her song You, Me and War to the 85,000 Syrians who have made their home in the Za'atari refugee camp, over the border in Jordan. Jenny encourages you to watch the video and support the Syria appeal. Help us make a difference in the lives of people in need in Jordan and other places throughout the world. World Service Committee member Jenny Moe documented the Syrian crisis through song. Listen to her touching tribute to refugees at the Za'atari refugee camp.